I'm running i88 and I'm on the way to convert to auto gearbox. The auto gearbox ecu receive 4 signal named idl, L1, L2, L3. The idl comes directly from tps sensor when there is no tps open angle to the gearbox ecu 0-12v, the other three signals are converting by engines ecu to 8 delta% tps openings. the the L1, L2, L3 are 0-5v signals outputs from oem engines ecu that are driving into gearboxes ecu for gear changing. I have attached the pdf of the gearbox logic and sensors to take an idea how it works. Go to page 4 to read accuratly my description. The question is: how can I drive these signals? Aux 4 needed 4 conditions, but only has 3 available so I've used a virtual aux channel to add more conditions. This is exactly what I have programmed, but in anyway I havent imagine this wiring. is it important to use pullup resistor? I'm a bit restricted as for the auxilliaries. I have some ign and some fuel free... But they have only two conditions available. What the solution here? Any firmware update could give me a solution. You need the pull up to allow a high signal. Other wise the drives have no way of providing a 5V signal. Firmware can be changed but it is a case of where that will sit in the priority list at this stage we have plenty to work through so a solution is not likely to be soon. You could move your fuel pump, check engine light, AC Clutch, and Boost control solenoid output to the spare fuel and ignition channels. Scott: For sure I could do this but I also need conditioning for other solenoids that I havent already connected, so I planned to move what you reffered to use thes ouputs for other usage. It would be nice if you could add the strings to the firmware if the harware could support this. It would be also nice if you could update the firmware to use also virtual aux 2 and 3 in the conditioning, I tried to use virtual 2-3 but they dont seem to be available in the list. Do you think that I have to upgrade to Thunder? Does thunder has more outputs with full conditioning abilities. Actually I have started with g4+ storm, the upgrade to i88 and keep the g4+ storm unused for another project because of the i/o ports were very few, so I wouldn't like to upgrade again to another ecu and spend such an ammount of money. It would be nice if you could add the strings...It would solve my hand.Fingers crossed. As Simon mentioned there is a priority list for firmware changes, and the list has quite a lot on it already. Generally items move up in priority from increased demand, so other users would be needing the same changes you are asking for. If others reading this do need them add a reply so we know. It would be also nice if you could update the firmware to use also virtual aux 2 and 3 in the conditioning, I tried to use virtual 2-3 but they dont seem to be available in the list. In the image above - the Aux 4 settings - the 3rd condition, I put a 1, you can put a 2 or a 3 here to use Virtual Aux 2 or Virtual Aux 3. Does the thunder has more outputs available with 3 conditions? The Thunder comes with 20 Aux Output channels. Currently 16 of these have the GP Output function. Aux 1 to 10 can have 3 conditions, and Aux 11 to 16 can have 2 conditions. However this is likely to change in future firmware releases and it is also quite possible there will be an increase in the number of Virtual Aux channels. Yes, the number of people wanting an increased amount of virtual aux channels is high and this is the reason it is likely to be implemented sooner than some other feature requests. It will solve the problem partially!!! !Actually the combination of using the virtual aux conditioning can give up to double conditioning capabilities. 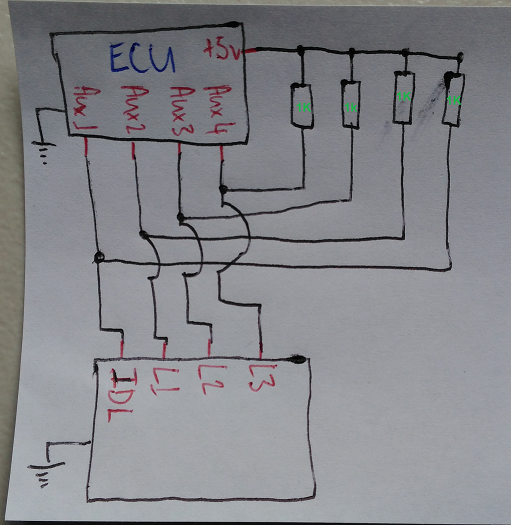 Its nice to play with conditions LOGIC especially for complex projects, this is also make a good STANDALONE ECU different from others, this is also a good reason for people to buy a good ecu vs a cheap, you know better than me that conditons makes the aux outputs double effective for the tuner. The more they are the best for the tuner. Edit: actually I would first try it without an external pullup. The ECU has a 1.5Kohm pullup to 12V built in so that might be enough depending on how much power that idl input needs.